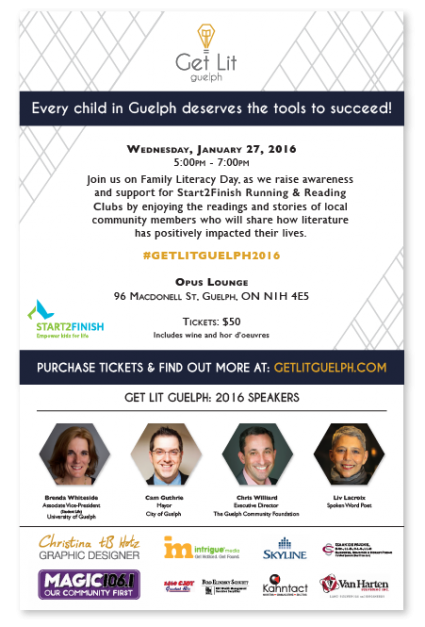 Get Lit Guelph is a new fundraising initiative by Start2Finish. The event features prominent Guelph community members who read an excerpt from a book or books that have had an impact on their life and share how it affected them. The local Start2Finish steering committee approached me about designing the branding & other materials necessary to successfully promote this event. The target audience of this fundraiser was and is, the more elite members of Guelph’s community. While all are welcome and encouraged to attend, it was understood that those who have are more able to give then those who do not. To reflect this, it was requested that the branding denote elegance and sophistication while referencing the nature of the event. 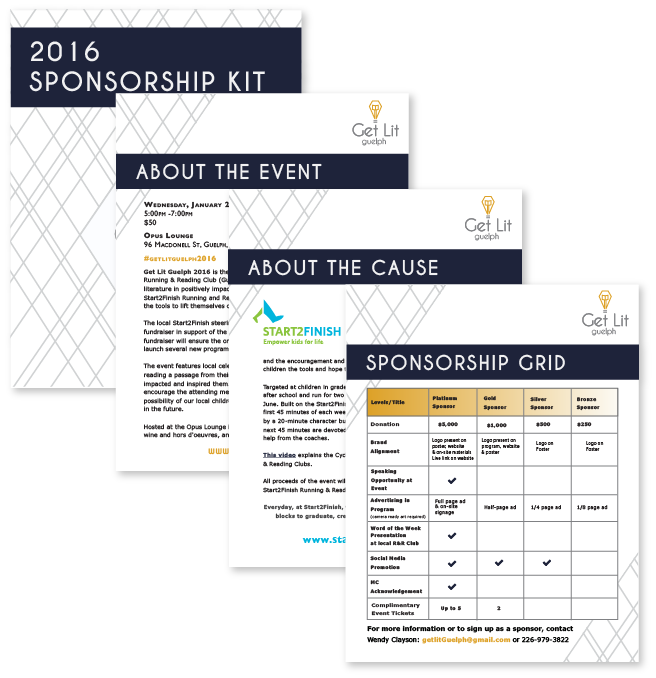 Since this event is a fundraiser, I wanted to communicate desire to inspire. The “Get Lit” can and does reference “Get Literature/Literate” which relates to the goal of Start2Finsh’s Running&Reading Clubs, but I also saw it as a challenge for the attendees to be lit with enthusiasm about the cause. Because of this, I chose to blend a geometrical lightbulb with the nib of a fountain pen. The first iteration of the logo had these two elements. The steering committee loved the direction that the logo was going, but expressed concern that since not everyone is aware of what a fountain pen looks like, the imagery might be lost. As such, they requested that a more obvious reference to literature be included. I played around with the lightbulb base for a while, but eventually settled on an open book/filament as the best solution. The sponsorship kit was the first main project after the logo was established. The dark blue header to contrast the grey and gold of the logo was a vital part of the branding. Blue is often associated with professionalism, and the drama of the colour added to the sophistication of the look. A grey diamond plaid type pattern was established as a grounding element for the more prominent visual elements. When working on the poster, I was struck by the fact that the photos of the speakers needed to be shaped in a unique way if they were to work with the already established elements. Rectangles and squares were too stoic and circles would contrast too much with the types of lines already in use. Initially I explored the notion of using the diamond shape from the pattern of lines, however there was not enough space to allow the reader’s photographs to be prominently featured. I looked to the logo for inspiration and noticed that I had inadvertently made the lightbulb top in the shape of half a hexagon. This was the perfect solution and I ended up incorporating the hexagon shape in more design elements. When starting to design the brochure for the event, I wanted to make an effort to include photographs of the people most affected by Start2Finish’s mandate– the children. Originally, this meant that various pages within the brochure had photographs in the background or beneath the text, but I still felt as if that was not sufficient to really reflect the goals of the fundraiser. Happily, the hexagons that I had used for the speaker photos came to be useful once again. 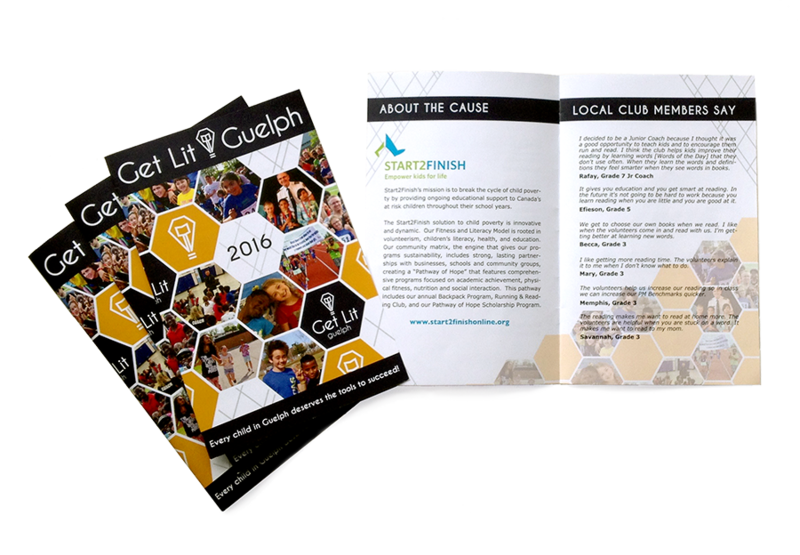 I laid them out in a honeycomb pattern and filled the majority of them with photos from the various Running&Reading events that had taken place in Guelph over the last year or so. 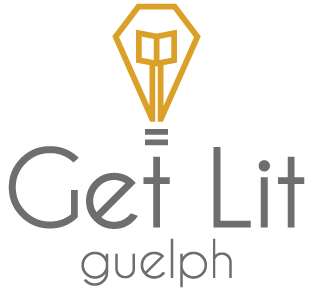 Including the other branding elements of Get Lit Guelph allowed the focus of the night to be obvious from the moment you picked up the brochure. 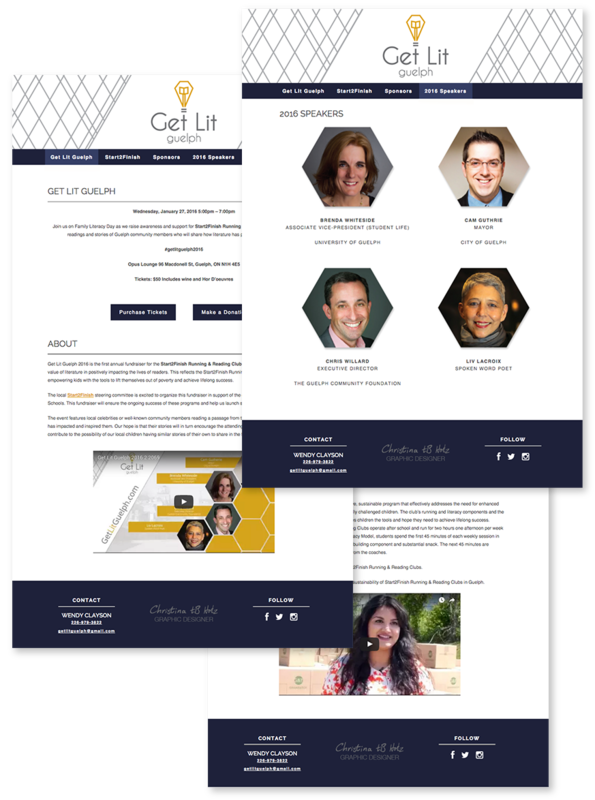 The Get Lit Guelph website was the second custom theme that I’ve designed for wordpress. Using the open-source theme underscores.me as a starting point, I incorporated the various design elements that had been established and ensured that the website is fully responsive and renders correctly on all devices. Since this event is meant to be an annual fundraiser, the website needed to be simple enough to highlight the general information, while also providing a foretaste of what attendees might be able to expect. 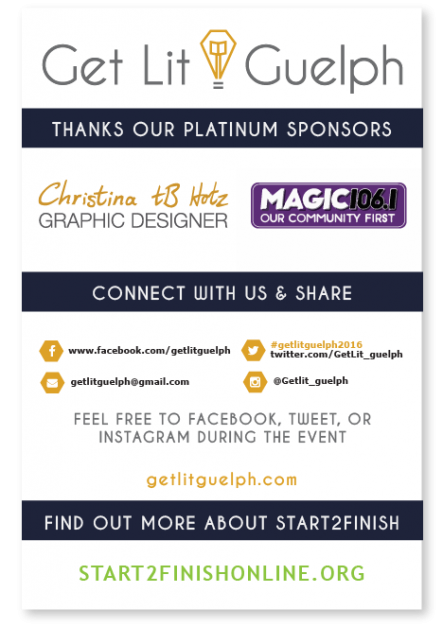 It was a great privilege to be invited to contribute to the goals of Start2Finish as the graphic designer for the Get Lit Guelph event. I hope to be working with them in the future as they look into the feasibility of taking this event and its branding to other cities across Canada.